i love law school. i like the challenge, i like the school, i like my peers (so smart!). but sometimes, i get stir-crazy. the law building is beautiful and all, but being trapped in here all the time is not good for the soul. today, i ventured down to the south part of the UCLA campus for a doctor’s appointment and seeing all those cute little undergrads reminded me of how much i loved going to college here. i thought about how i used to climb janss steps to get to class or sit on the rolling grass hills with eric and monica. maybe i’d grab a scoop of ice cream at northern lights (now they have fro-yo). the buildings are so collegiate – no wonder a million and one movies are filmed here! i miss that part of UCLA. 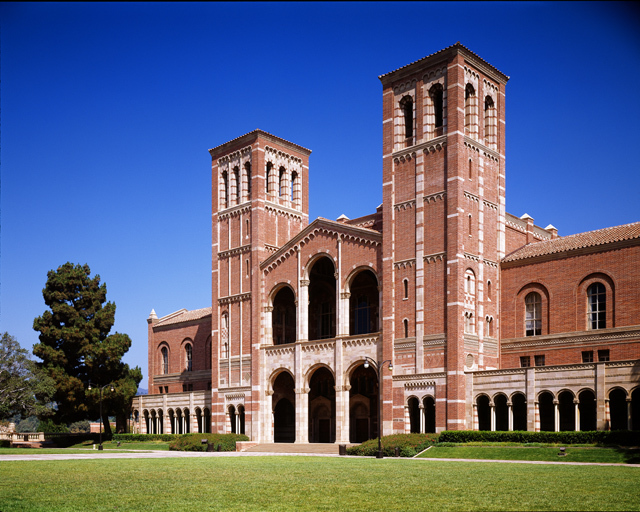 the usual pic of royce hall (i graduated there) *also notable that the towers aren't symmetrical. one has three arches and the other only has two. today’s little walk inspired me to walk the campus more. get some fresh air and a little perspective. perhaps tan a little bit, too – not that i need it too badly.